Subway Shijo station 8 minute walk Take exit 13 from the underground and exit out onto Shijo dori. Walk along the left side and turn left at the first block and it would be located after two and a half blocks. 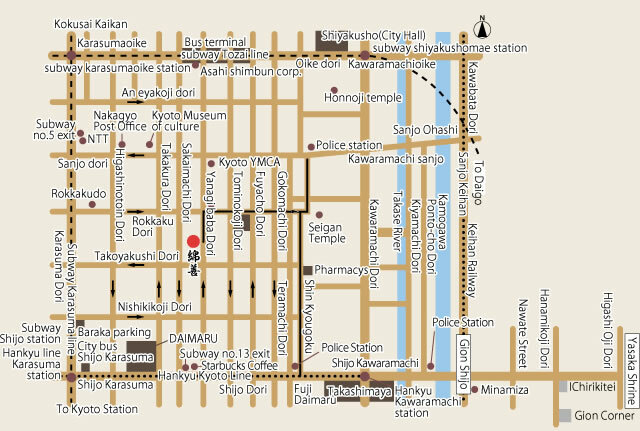 Direct airport shuttle service to the Ryokan! MK Skygate is convenient. Take advantage of the savings and reserve from anywhere, anytime through your PC or mobile phone. Please make your reservation by 5:00 p.m. two days before your date of accommodation. then turn right at Higashi dera. and you will arrive at Shijo horikawa. two traffic lights at Starbucks then you will arrive after two and a half blocks. right at the Karasuma dori Gojo intersection. Continue north and turn left at Karasuma Shijo. After you pass Daimaru then pass two traffic lights and turn left at Starbucks. Continue two blocks and a half and you will arrive at the Ryokan. For those taking taxi, please request to be taken to the Yanagino Banba Takoyakushi Agaru. for you to walk although it is only a five minutes walk. we sell parking service ticket for 2,000 yen at the front desk so please take advantage of this. 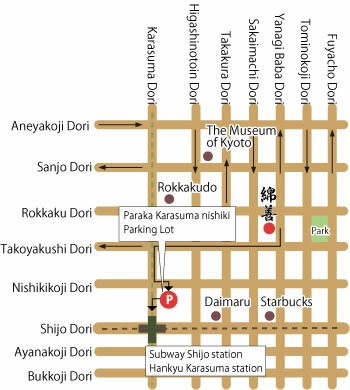 For microbus and large size buses please use the Nijo Jo Parking. 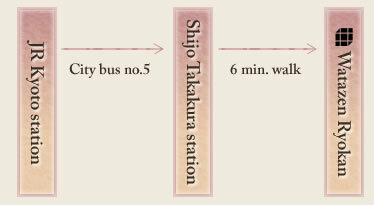 Take the City bus no.5 and get off at Shijo Takakura station, then walk six minutes to the Ryokan. 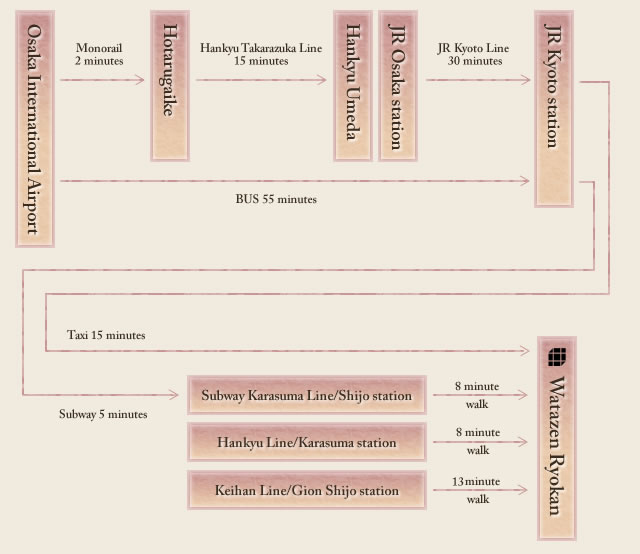 (Kyoto bus/City bus) and subway.